Terry Gilliam’s latest magnum opus, featuring Heath Ledger in his fateful last ever role, is opening tomorrow in cinemas across Britain. The Imaginarium of Doctor Parnassus is a beautiful gothic fantasy set in modern day London. The story revolves around the mysterious Doctor Parnassus who has the skill to guide your thoughts to reveal your inner imaginary world. Parnassus was once a monk who made a deal with the devil for long life, and many other deals and bets since then, one of which involves the soul of his first child due at the age of 16. 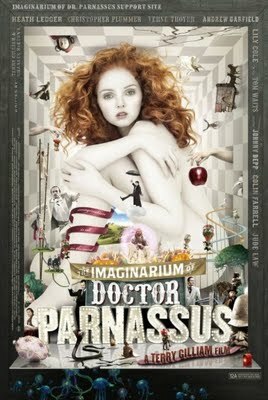 Parnassus tried to prevent this by never having a child, but (un)fortunately he did – a daughter played by the sparkling Lily Cole. And so the scene is set for the story. As Parnassus and travelling show troupe try to save his daughter’s soul they come across Tony, played by Heath Ledger, hanging from Southwark bridge. They save him and he, in turn, acts to save them – or does he? All is not clear as Tony’s character evolves. Along the way Tony finds out about Parnassus’ magic mirror that reflects your innermost mind and enters it himself – and it is here that Terry Gilliam’s genius saved the movie when Heath unfortunately passed away – every time Tony enters the mirror he becomes another actor; Johnny Depp, Jude Law and Colin Farrell all take up the reigns to play the mirror Tony and to great effect. Go and see this movie. You won’t see much press about it as Terry Gilliam is one of the most talented Directors in the world today but his movies never sit comfortably in the ‘blockbuster’ genre and so marketing departments seem to give up in despair – instead he makes us pay attention to the wonders he creates on screen and use our brains and imaginations to full effect. Parnassus sits with Gilliam’s classic fantastical movies; Time Bandits, Brazil, Baron Munchausen and the Brothers Grimm – all wonderful flights of fancy and visual feasts. More info on the film and a larger copy of this wonderful poster can be found here. I just stumbled across the trailer for the new Coen Brothers film – Burn After Reading – and I am mighty excited. It’s a comedy spy movie starring Brad Pitt and George Clooney amongst others, and it even has an Elbow song on the trailer. What more could you want? Oh. You want more? OK, how about Frances Dormand and John Malkovitch then. Good enough for you now? Well OK then! A new documentary, Man on Wire, has just been released that describes how tightrope walker Phillipe Petit carried out his audacious high wire act between the twin towers of the World Trade Center back in 1974. You can see another interview with Petit and director James Marsh over at the BBC, where there are also a few clips of the movie. It looks stunning, and for me certainly very emotional to see down from the views that we used to have looking out of the 96th floor. To help pre-celebrate tomorrow’s Canada day, we went along to see Wall-E, the latest masterpiece from Pixar. I don’t know how Pixar always make me think their movies will be a bit crap from the trailers, but they do. Thankfully the movie is wonderful. The story follows a garbage collecting robot as he scurries around a trash covered planet Earth sometime in the future. An inquisitive chap, Wall-E collects trinkets, repairs himself with parts from his fallen colleagues and has a pet cockroach. Yes, that’s right. Pixar are so damn good these days they can make you emotionally connect not only with robots, but cockroaches. In fact for the first half of the film you hardly see a human at all and there is very little spoken – the epic scenes of abandoned cities full of garbage, with a futuristic sound track just fill you with wonder and sadness at the same time. Wall-E is an ecological love story between two robots – one the red-headed step child of Number Five from Short Circuit, the other the evolved pinnacle of iPod style design. The film tells us the ultimate end point of our consumerist obsessions, but never preaches and offers a hopeful ending as the credits roll. It’s a heart achingly beautiful movie, yet fun to watch. What more could you want? 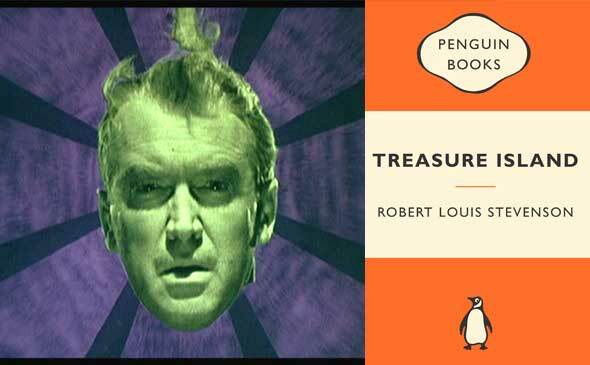 Author Matt HobbsPosted on February 18, 2008 July 4, 2010 Categories ConsumeTags Colin Farrell, Genius, Hollywood, Johnny Depp, Jude Law, movies, Terry GilliamLeave a comment on Terry Gilliam’s Latest Film to Continue?